A little like my raised vegetable beds– for a long time too wet to plant, then baked by the sun– with our weather forecast continuing to shift from hot-and-sunny back to cold-and-wet, I find myself not at my best. I’m tired, and simply not feeling robust. I want something warm and nurturing, yet also light, and bright in flavor without being spicy hot. My raised bed zucchini and yellow squash, my tomatoes and hot pepper starts are finally settling into the season and beginning to grow well; thankfully my herb garden and especially the mint is thriving! 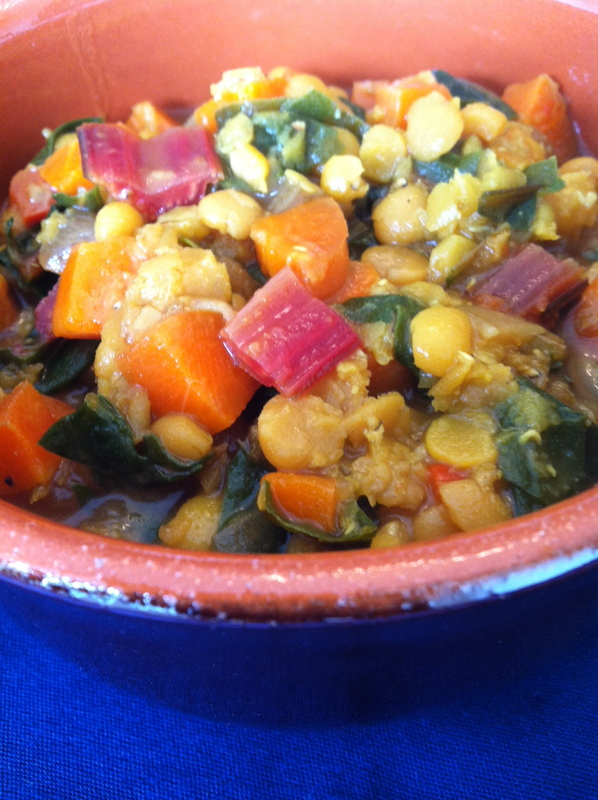 So I took my cues from them for this meal… with good protein with the lentils and quinoa, lots of vitamin C with the yellow pepper and lemon, also lots of fiber, folate and B vitamins with the lentils and greens, plus a lovely mix of flavors with earthy and sweet notes. Place currents in a small bowl or glass, and cover with white wine– I used a Pinot Grigio with hints of green apple that I had open already. I ended up soaking them overnight as my evening plans changed… and fortunately did not finish off the bottle that night, as the Pinot Grigio proved to be a perfect complement for this meal. Cull through then rinse the lentils, cover with fresh water, bring to a boil then reduce heat and simmer covered for 15-20 minutes. Cook until soft but not mushy, draining any remaining fluid. Let rest without lid ’til cooled. Rinse quinoa well, then cover with a generous cup of fresh water, add a dash of salt, bring to boil then reduce heat and simmer for 18-20 minutes, until water is absorbed. Fluff with fork, let cool uncovered. While lentils and quinoa cook separately, saute the shallots, garlic, and zucchini in a couple tablespoons olive oil for about 3 minutes, until shallots are just barely beginning to brown and zucchini is bright. Transfer to casserole dish with lid. Next saute the yellow peppers for 2 minutes, until bright and just barely softening. Transfer to casserole dish. Mix lentils and quinoa together well, then mix in cooked veggies and diced herbs. Season with fresh ground pepper, dress with juice and pulp of lemon. This will store in air tight container in fridge for a day or two. I served this warm over mixed greens including some peppery arugula and earthy spinach, with a glass of cold Pinot Grigio. A cold rainy night and a potluck dinner with extended family, old friends and new – that calls for big pots of chile and vegetarian lentil soup. This lentil soup has been my favorite for as long as some of those childhood friendships! It’s healthy and satisfying, smells and tastes great, is inexpensive and easy to make, and a virtual “bottomless pot” as it’s delicious as a thick stew or as you add more water while it simmers to feed more people. Goes great with a glass of red wine or a chilled microbrew, a mixed green salad or a bowl of chips, depending on who shows up. In large 5 quart soup pot with lid, saute chopped onions and red potato in 2-3 T olive oil. After 2-3 minutes add minced garlic and red peppers, chopped rutabaga, turnip, carrots, and celery, oregano, basil, thyme, and sage, continuing to saute for 2-3 minutes. Add carefully culled and rinsed lentils and basmati rice, stir well. Add canned tomatoes including juice and red cider vinegar. Put 8 cups water on the stove top to heat til near but not boiling, then add 6 cups to the soup pot and stir well. Cover and bring to simmer, then lower heat and cook with lid just slightly cracked open for 1 hour-1.5 hours or so, checking and stirring occasionally. Add more water as it cooks, getting all 8 cups in to create a thick stew, or yet more water to create a thick soup. Test rutabaga, carrots, and lentils for doneness. Once vegetables are soft, lentils and rice fully cooked, add 1 t salt and fresh black pepper to taste. Serve topped with Parmesan cheese. Tastes even better the next day. Freezes well. In large soup pot, saute chopped onion in 2-3 T olive oil for 3-4 minutes, add garlic and cumin seeds and continue to saute for 2 minutes. Add coriander and tumeric, stir well as add in lentils and split peas. Add the dissolved bouillon plus 3 1/2 cups water. Bring to boil then reduce heat to simmer, covered, for 20 minutes. Add chopped carrots and simmer 15 minutes. Check softness of split peas and carrots, and check fluid level- add more if nearing sticking point or if you desire more of a soup. Then add red pepper and chard, simmer covered for another 4-5 minutes until chard is bright green and soft but not mushy. Add 1/2 t salt and black pepper to taste. Serve with basmati rice.